HAGERSTOWN, Md. (AP) — Inmate dog-training programs often draw positive attention for prisons, but they also can open the door to potential problems — from bites to smuggling — that can creep in because of a lack common standards or central organization, according to experts. More than half of the nation's state prison agencies have the programs, according to William Paterson University sociologist Gennifer Furst. Inmates also train dogs at 19 federal correctional facilities, Bureau of Prisons spokesman Justin Long said. Yet no correctional or animal-welfare organization promotes broadly applicable standards for selecting animals and inmates to minimize security and liability risks. "That's definitely a problem," said Furst, author of the 2011 book "Animal Programs in Prison: A Comprehensive Assessment." Without common standards, individual prisons sometimes partner with local animal shelter and rescue groups to create programs lacking detailed, written operating agreements, The Associated Press found in a survey of 11 state agencies. "Typically, these programs have been one-offs," said Bernie Unti, senior policy adviser for the Humane Society of the United States. "There's no central organization, there's not real guidelines and, quite often, the people active in the field don't know one another and aren't aware of one another." Hundreds of inmates at scores of prisons across the country train service and assistance dogs, prepare shelter dogs for adoption and even provide obedience training for house pets. Furst said the programs help calm prisons by giving eager inmates an incentive to behave. And the inmates, some of whom are paid for their work, learn skills that can help them find jobs after they're released. Assistance dogs trained in a regimented prison environment were found by a Tufts University study to perform better than home-raised dogs, suggesting the inmates are saving more shelter dogs from euthanasia and providing more service animals for the disabled. 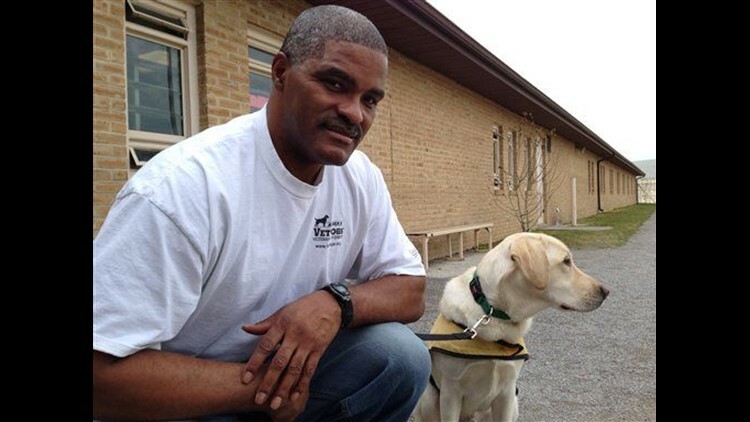 Paul Mundell, secretary of accrediting organization Assistance Dogs International, said the keys to a successful program include transparency between the prison staff and the dog provider, a thorough inmate-screening process and strong support from the prison warden or correctional agency. — A Maryland inmate who was allowed to walk his dog outdoors at night alone allegedly used the trips to retrieve contraband from a drone flown over the prison's 12-foot fence. At his trial Wednesday, the judge acquitted inmate Charles Brooks of 27 charges but said the jury still can consider those alleging he conspired to possess and distribute drugs that were found with a drone in a pickup truck belonging to one of two convicted co-conspirators. — A Kansas inmate escaped in 2006 by charming an animal-shelter worker into smuggling him out in a dog crate inside her van. — An Ohio inmate bitten by a dog won a $15,000 judgment in 2002. — A Maryland prison's pet-adoption program, launched without a written agreement, grew to include dogs and cats supplied by three organizations in two counties. The state Department of Public Safety and Correctional Services killed the program after an inmate and staff member were bitten. Wayne Webb, Maryland's acting corrections commissioner, said the drone incident mainly reflected a lack of drone-detection capability, a problem for prison agencies nationwide. He acknowledged, though, that the inmate may not have been an appropriate candidate for the America's VetDogs program, which trains service dogs for disabled military veterans. Webb said the agency now requires staff to know when an inmate takes a dog out to relieve itself, so that the inmate can be observed. Most other state agencies surveyed by AP said they have similar rules for inmates living with dogs. In Kansas, inmate dog trainers can't go out after the yard closes. "There is no exception to this, and any mess would need to be cleaned up by the inmate," Adam Pfannenstiel, spokesman for the Kansas Department of Corrections, wrote in an email. Prison agencies surveyed by the AP generally limit program participation to inmates with exemplary behavior and exclude those convicted of animal cruelty or predatory sexual offenses. Some states also exclude maximum-security institutions or inmates, either because their movements are more restricted or as a good-behavior incentive. "You have to work your way down into the facilities that offer these programs," said Laurie Kilpatrick, spokeswoman for the Colorado Department of Corrections. America's VetDogs spokesman Bill Krol said his organization, based in Smithtown, New York, defers to prison officials for inmate screening and then interviews the candidates before deciding if they can join the program. America's VetDogs is accredited by Assistance Dogs International, which publishes guidelines for assistance-dog organizations looking to partner with prisons. Organizations accredited by ADI have at least 106 prison-puppy programs nationwide, spokeswoman Jeanine Konopelski said. Colorado's prison agency won't partner with dog providers that aren't ADI-accredited, according to the agency's website. The ADI guidelines include expectations for written agreements with the prison and dog handlers but acknowledge potential conflicts with individual prison protocols. "It's very tough to create kind of an absolute blueprint for these programs so that they replicate one another," said the accrediting organization's Mundell, who is also CEO of Canine Companions For Independence, a provider of assistance and service dogs. Associated Press journalists Donald Thompson in Sacramento, California; Jim Anderson in Denver; Kate Brumback in Atlanta; Melissa Hellmann in Topeka, Kansas; Michael Kunzelman in New Orleans; Adam Aton in Jefferson City, Missouri; Andrew Welsh-Huggins in Columbus, Ohio; Mark Scolforo in Harrisburg, Pennsylvania; and Juan Lozano in Houston, Texas, contributed to this report. This story has been corrected to attribute the information about federal prison dog-training programs to a Federal Bureau of Prisons spokesman, not Gennifer Furst.